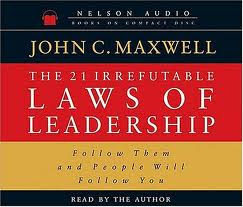 I've long been a fan of John C. Maxwell. This is not because of who he is (a church pastor) or what he's not (some self-professed guru) but because he has a rare and very special grasp of Leadership. When you read his work you know there's not just passion but substance, depth and truth. I rate this as a Leadership 101 book and would encourage anyone with Leadership aspirations to not just read this work but become a student of the content and become fluent with the Laws he references. These by the way are not religious laws but laws that are based on facts and principles- in other words they endure. The reason the book attracted me was his first Law called "The Law of the Lid". This is a great way to check if someone is a leader. Do they spend more time developing their Leadership potential than simply striving to be successful? He uses the McDonald's example. The McDonald's knew how to take their business so far. Ray Kroc (then a 52 year old man with health problems) had the vision to see what that business could become and made that happen. He was a Leader, the McDonald brothers were not. The reality is if you want things to change, grow and get better. The "Leadership Lid" will always be the limiting factor. If you work at raising the lid the effectiveness increases and things change. All things emanate from that. He says that when you need to change things in a business, team, voluntary group the first thing you need to do is change the Leader. Why?- If the Leader could lead they would be doing it already. They may need help, time to develop, but unless you make changes at the top nothing gets better. Would you pass the "Law of the Lid" test...? Can We Learn Anything Meaningful From TV...?